The Abeka language arts program integrates and balances the learning of subject matter with the development of language skills. Grammar, word usage, mechanics, spelling, vocabulary, reading, and penmanship are taught, practiced, and reviewed thoroughly. Your child will become even more proficient in the skills of cursive writing, oral reading and interpretation, reading with speed and comprehension, clear and correct oral and written communication, and logical thinking. 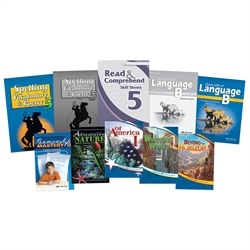 The Grade 5 Language Arts Child Kit contains texts and correlated assessments for the grade 5 language arts program—10 items total. (Also highly recommended are the novels Rosa and Noah Webster: A Man Who Loved Words for book reports, sold separately.) 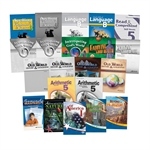 Combine this kit with the Grade 5 Language Arts Parent Kit, and you can confidently teach and guide your fifth grader through a year of academic excellence in language arts. He will be building a foundation for lifelong learning and success. Reading—Reading from a wide variety of selections and genres in his three story collections and two recommended novels inspires your child with Christian ideals and spiritual values. The program also provides instruction and practice in reading speed and comprehension skills development. Grammar and Composition—Fifth graders learn to use their language naturally from the useful, practical way that grammar is taught in conjunction with composition, research, and oral usage. Spelling, Vocabulary, and Poetry—A straightforward teach/practice/test approach makes spelling “second nature” to your young writer. The interesting weekly lists cover such topics as home, French words, food, and more. Your child will also learn to spell, define, and use 10–20 vocabulary words in each lesson. And what an accomplishment when he can recite from memory all 6 poems! Penmanship—Your child will begin daily penmanship practice with a review of “trouble-maker” formations and then graduate into creative writing and journal entries.